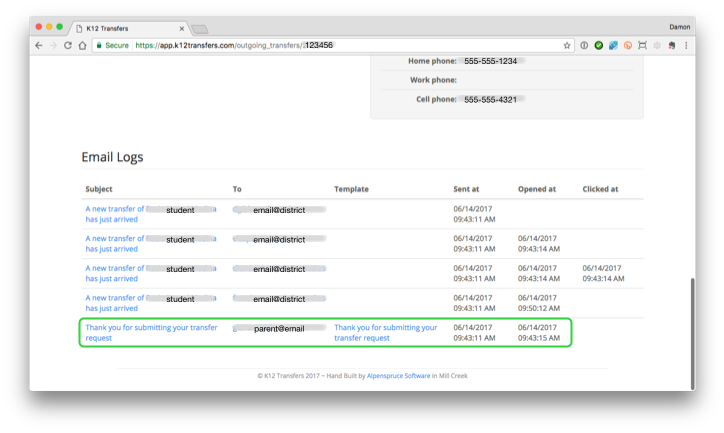 K12 Transfers supports email notifications for parents that allow parents to know the status of their student’s transfer request without having to contact the district office. This makes for a much better experience for parents and reduces support costs for the district. However, one challenge that remains is that parents don’t always enter their email addresses correctly. We can’t fix that but today we’re released a feature that provides a brief audit for email notifications. You can see the addresses emails were sent to, when they were sent, if they were opened, and if links in the email were clicked. Now on every transfer request, you have an audit trail for all the emails that were sent regarding the transfer. I’d also like to take this opportunity to remind you that there are two features that many of you are not using. The first is “on submission” email templates. This template notifies parents when they submit their transfer requests so that they know their transfer is “in process.” The other is granting sites access to view approved transfers. This allows sites to see approved transfers as and when they are approved so that you don’t have to send them spreadsheets in email.